The timing of my visit to Lichfield means I missed the installation of Canon Andrew Stead as Canon Precentor in Lichfield Cathedral on Sunday afternoon and, sadly, that I am going to miss an old Lichfield custom this year, and I am also going to miss an exciting exhibition in Lichfield Cathedral. Every year on Saint George’s Day, the officials of the Court Baron and View of Frankpledge in Lichfield – also known as Saint George’s Court – gather at the Guildhall to appoint the officers of the manor of the Barony of Lichfield. The Mayor and Councillors install two High Constables, seven Dozeners (or petty constables), two Pinners and two Ale Tasters and there are annual reports from the Constables. Fines are imposed by the jury for any transgressions over the previous year and a feature of the event are the ridiculous reasons given for non-compliance with the rules. It is a fun day, and when Saint George’s Day falls on a Sunday, the court moves to Saturday 22 April instead. This year, therefore, the court sits on Saturday, 22 April. Admission is free, but space is limited inside the Guildhall – so arrive early. The painter JMW Turner (1775-1851) claimed he was born on Saint George’s Day, 23 April, although there is no proof of this. In his early years, Turner worked for the architect James Wyatt (1746-1813), who was born in Weeford, near Lichfield. However, the timing of my visit to Lichfield this week means I am also going to miss ‘Mr Turner Comes to Lichfield’ – an exciting exhibition celebrating the works of Turner – which begins in Lichfield Cathedral next Monday [24 April 2017] and continues until 11 June. This is a rare opportunity to see Turner’s watercolour of Lichfield Cathedral, which he painted in 1832 and which is the centrepiece of this exhibition. Until recently, this painting was in a private collection, and it goes on public display next week for the first time in many years. Alongside it are Turner’s sketches for the painting, loaned by Tate Britain. 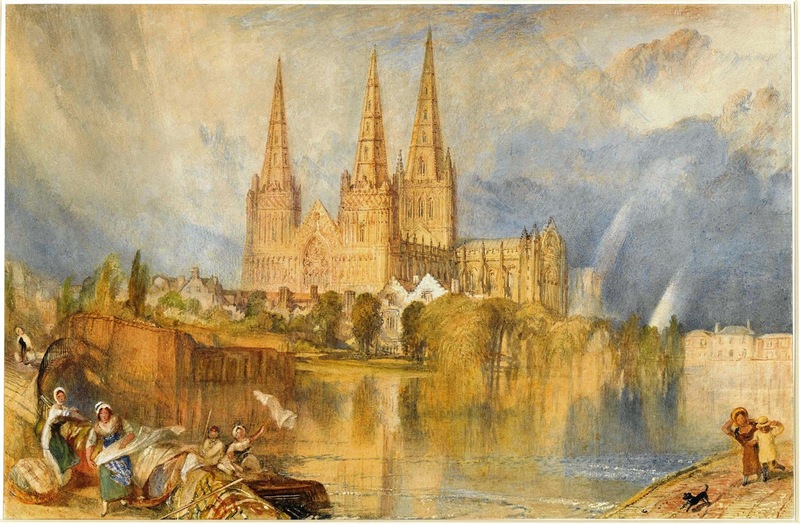 The Turner exhibits are joined by 17 pictures showing how artists have portrayed Lichfield Cathedral over five centuries, seeing the same building in their own distinctive ways. These include paintings from the city’s Samuel Johnson Birthplace and from other private collections, and a new work by Peter Walker, Lichfield Cathedral’s artist-in-residence. Also included are the winning entries from the Cathedral’s 2016 art and photography competition. This exhibition is free, but the cathedral relies on generous donations to stay open. Other activities in association with the exhibition include a showing of the award-winning film Mr Turner starring Timothy Spall and directed by Mike Leigh, and a production of the West End play The Painter. Lichfield Cathedral is presenting a showing of Mr Turner on Saturday 29 April at 6.30 p.m., with a private viewing of the Turner exhibition beforehand. Tickets may be bought from the Cathedral shop at No 9 in the Cathedral Close. A fundraising gala dinner takes place in the cathedral nave next month [12 May] to raise funds for restoration work at the unique two-storey Chapter House, home to important collections including the eighth century Saint Chad Gospels and a 15th century manuscript of Chaucer’s Canterbury Tales. Then, from 29 May to 3 June, Lichfield Cathedral and Saint Mary’s in the Market Square are presenting The Painter by Rebecca Lenkiewicz. The play is made up of a number of vignettes of Turner’s life and takes place in his studio and around London from 1799 on, covering several decades of his life. Iain Fletcher stars as Turner alongside a small cast. Once again, tickets are available at the Shop at No 9. In the past, I have written about Richard FitzRalph, the former Dean of Lichfield who became Archbishop of Armagh, and about the curious position of the Archbishops of Dublin who for centuries were Deans of Penkridge in Staffordshire and who refused to accept or acknowledge the episcopal rights of the Bishops of Lichfield within their ‘peculiar’ or parish. But the connections between the Church of Ireland and Lichfield were often understated but positive contributions. 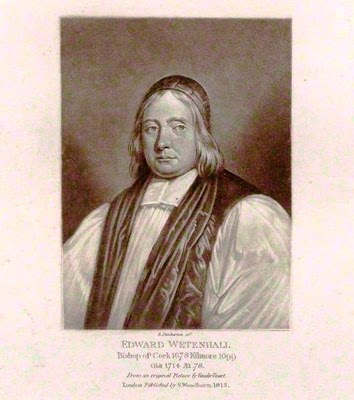 I am reminded during my stay in Lichfield this week of Edward Wetenhall (1636–1713), a bishop of the Church of Ireland at the turn of the 17th and 18th century, who was born in Lichfield. He is celebrated by 19th century historians of Lichfield, including Thomas Lomax and Thomas Harwood, as one of the ‘eminent characters’ of Lichfield, and in Ireland he sought to play a conciliatory role at a difficult and tumultuous time in the life of the Church. 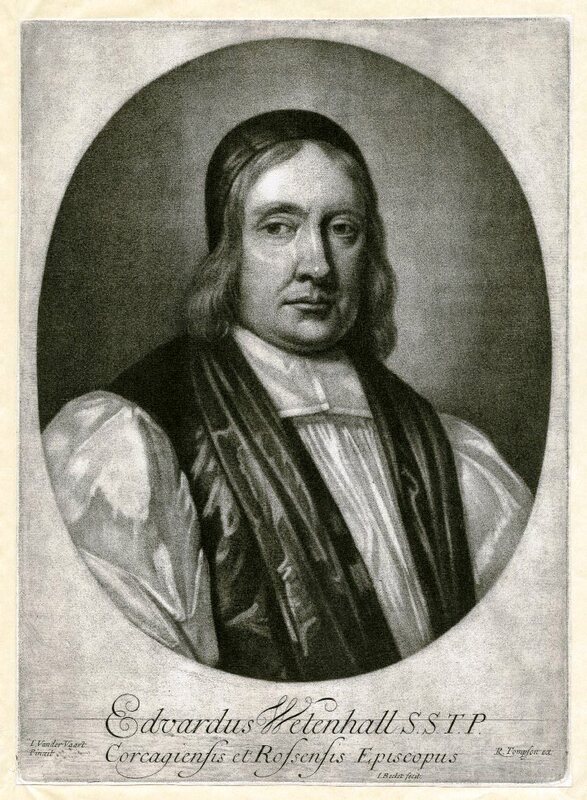 The bishop – whose surname is also spelled Wettenhall, Whetenhall, Whitnall, Withnoll, and Wythnall – was born in Lichfield on 7 October 1636, but we know little about his family background or circumstances. He was sent to school in Westminster School, where he was taught by Richard Busby, before going on to Trinity College, Cambridge, as a foundation scholar. After graduating BA (1659-1660) in Cambridge, he moved to Oxford, where he became the chaplain at Lincoln College. He was a priest in parishes in Combe Long, Oxfordshire, and at Saint Stephen’s, near St Albans, Hertfordshire, before being appointed a canon of Exeter Cathedral in 1667 and headmaster of the bluecoat school there. He received the degrees BD from Oxford at 1669 and Cambridge in 1670. In 1672, Michael Boyle, the Archbishop of Dublin, invited him to Dublin as master of the bluecoat school, now the King’s Hospital. There may have been a Lichfield connection here too, for Archbishop Boyle’s uncle, John Boyle, had been Prebendary of Bishopshull in Lichfield Cathedral before coming to Ireland as Bishop of Cork. In Dublin, Wetenhall received the degree Doctor of Divinity (DD) at Trinity College Dublin, and he also became curate of Saint Werburgh’s Church and chantor of Christ Church Cathedral. When Michael Boyle became Archbishop of Dublin, he was succeeded by Edward Synge, Bishop of Cork, Cloyne, and Ross. When Synge died at the end 1678, the dioceses were separated, and early in 1679, Wetenhall became Bishop of Cork and Ross, once again, presumably, through the patronage of Michael Boyle, who was appointed Archbishop of Armagh at the same time. Wetenhall was consecrated bishop in Christ Church, Dublin. At his own expense, he restored the bishop’s palace in Cork. As one of the seven bishops who remained in Ireland during the dynastic struggles and political troubles that began in 1688, he was treated badly by the supporters of James II, but he insisted on staying on in Ireland. Following the defeat of James II and the victory of William III, only one Irish bishop, William Sheridan of Kilmore and Ardagh, was deprived of his see in 1693 as a nonjuror. The see was left vacant for three years, and when Wetenhall was appointed Bishop of Kilmore and Ardagh in 1699 in succession to William Smyth, he at first declined the appointment in the hope of persuading Sheridan to return to Kilmore. Later, as Bishop of Kilmore, Wetenhall contributed to the financial support of Sheridan. He also restored the bishop’s house in Kilmore, Co Cavan, rebuilt the cathedral at Ardagh, which has since been demolished, and recovered diocesan lands that had been alienated by predecessors. Edward Wetenhall was married twice. His first wife was buried in Cork cathedral. One son, John Wetenhall, became Archdeacon of Cork; another son, Dr Edward Wetenhall, married Anne Sneyd from Staffordshire. Failing health seems to have persuaded Wetenhall to spend his later years in London. He died there on 12 November 1713 and is buried in the south transept of Westminster Abbey.